The quote for Holiday Celebration at Disney Epcot in Orlando is an event that year increase popularity. Orlando Discount Tickets USA is referring to the Candelight Processional which is a event of selected night in which celebraties come to bring life to the spirit of the Holiday with the purpose of salute the season with joyful songs and sound by a 50 piece Orchestra of sublime choirs. The Candelight Processional at Disney Epcot in 2016 will bring the next celebraties that will narrate Christmas Stories. The celebrities appears 3 times on the selected dates to give more options to the visitors to enjoy the event. December 28 to 30, 2016: Cal Ripken, Jr.
Visit for one day at Disney Epcot has a cost of $97 dollars plus tax but you can get it for only $39 dollars per person with tax included by participating in one of the Orlando Discount Tickets USA ticket promotion. 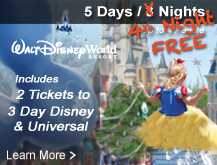 Visit Orlando Discount Tickets USA to discovery and customize your next vacation package or ticket promotion to Orlando Florida. Magic Kingdom, Hollywood Studios, Epcot y Animal Kingdom son las cuatro opciones primarias de parques de Walt Disney World. En el caso de Animal Kingdom, no siendo tan popular como Magic Kingdom es un parque sumamente atractivo que además de estarse renovando con nuevos shows nocturnos como “Rivers of Light” Rios de Luz y la Tierra de Avatar que ya se puede observar bajo contruccion y que estara lista para finales del verano del 2017. La extension de Animal Kingdom es bastante amplia con de 500 acres, es el parque temático mas grande de Disney en el cual puede experimentarse un Safari de 110Acres para sentirse como en Africa. Como parque temáticos el porposito de Animal Kingdom es la diversión, la apreciación de la belleza y la conservación de mundo animal. Aunque muchos lo asocian con un gran zoológico Animal Kingdom esta lejos de ser un zoológico para ser un espacio en el cual el equipo creativo de Disney se inspira, crea entretenimiento y shows con los films de Disney que involucran animales. Para tus próximas vacaciones especialmente si viajas en familia Animal Kingdom representa una aventura familiar sin precedentes para la cual Orlando Discount Tickets USA contribuye a través de estupendo descuentos tanto en paquetes vacacionales, como en ingresos para el parque temáticos de Disney Animal Kingdom. Con Orlando Discount Tickets USA encontraras que las ofertas comienzan desde $169 dolares para 4 dias y 3 noches e ingreso para 2 personas a través de una charla de mercadeo en uno de nuestros resorts afiliados. Exhibiciones Animales: En la zone de afectos, en la estación de conservación, en el Safari de Kilimanjaro, en exhibición de Oasis los visitantes tendrán opción de observar animales de diferentes especies y continentes. Encuentro con personajes: En este parque encontraras desde el clásico Mickey and Minie hasta chip and dale. Desfile: Titeres gigantes y personajes comicos participan y danzan en este desfile el cual da comienzo en Islan de descubriemiento y finaliza en Africa. Atracciones: Que seria de un parque de Disney sin atracciones? En este caso Disney Animal Kingdom tiene gran entretenimiento con Dinosaurios, Expedicion Everest, Kali Rapidos del Rio Kali, etc. Shows en Vivo: Como leyenda del parque esta el Festival del Rey Leon y Encontrando Nemo el Musica. Ambos son totalmente recomendados tanto para chicos como para adultos. Presentaciones Callejeras: Artistas y músicos están a los largo del parque con diferentes paradas de entretenimiento y música del Asia, Africa, India etc. Disney Animal Kingdom es sin duda un parque sumamente especial y con la apertura de sus nuevos shows y zonas sin duda es un parque para incluir en tus proximas vacaciones a orlando Florida. Visita www.orlandodiscountticketsusa.com para encontrar el paquete promocional para Orlando a su medida. On selected nights of November and December the Theme Parks of Orlando celebrate the Holidays with the most charming elements to give visitors an unforgettable time of reunion and share. One of the most popular celebration for Christmas is Mickey’ Very Merry Christmas celebration at Disney Magic Kingdom but actually this in an event that has a separate admission while other theme parks like Universal Studios Orlando and SeaWorld don’t. 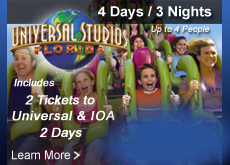 Orlando Discount Tickets USA offering vacation package for Orlando Florida and discounted tickets promotions inform to you what is to celebrate at Universal Studios and Universal Island of Adventure Orlando during the Holiday time in Orlando Florida and invite to you receive information to plan your vacation packages for Universal Studios and Island of Adventure starting at $249 dollars. The Holiday celebration is dressed with The Macy’s Holiday Parade which is commemoration for what is for many of us “The Macy’s Thanksgiving Parade”. At Universal Studios visitors can enjoy from December 3rd to January 1st. Between the nights of December 3er through the 18th parade will begin at 5:00pm and from December 19th – January 1st, On the Macy’s Parades you can transport yourself to New York and enjoy the marching bands, clowns and appearance by Santa himself along with the giant floats and balloons. For the kids there also a special musical show at the Barney Barnyard Holiday celebration where kids will enjoy Barney and his friends songs. Santa is coming to Town is another Holiday show to gather families around Christmas. With The Blues Brothers Jake and Elwood perform Holiday Songs like Blue Christmas and amore under the snow at Delancey Street in Universal Studios. If you celebrate out of ordinary the place for your Hollyday Celebration is Universal Island of Adventure at Seuss Landing with a whimsical wintry wonderland. Besides the atmosphere the Grinchmas Who-liday Spectacular is retell staring the Grinch. Grinchmas Who-liday Spectacular Show Times Start will be performance on Dec 5-9,12-14 and Jan 1 at 11:30 am, 12:30pm, 1l30 pm, 3L45pm, 4L45pm, 5:45pm and on December 3,4,10,11,15,31 at 10:45am, 11:45am, 12:45pm, 1:45pm,3:30pm, 4:30pm, 5:30pm,6:30pm. Universal Studios and Universal Island of Adventure can be visited at affordable price with Orlando Discount Tickets USA by purchasing Tickets Promotion that start from 1 day base for only $29 dollars per person or vacation packages starting at $169 dollars. For the early summer of 2017 details has been revealing simultaneously and now is tha time to write about the Center Piece of Volcano Water Park which is Krakatau Aqua Coaster which is a Canoe Water Coaster. The Krakaau Aqua Coaster is one of the main attraction of the Vocano Bay Water Park and will take guest through the 200 foot-tall Krakatau Volcano. To enjoy the coaster boarding canoes are available to travel both down-and uphill. On the coaster will be darkness and ligh and fun waterfall as the guest go through a mysterious Island. The waterfall of Krakatau Aqua Coaster will feature a 170-foot waterfall. The new Universal Studios Water park is 30 acres park that is a total new and attractve concept on the trend of Water parks in Orlando Florida. This new wáter park different to the actual wáter parks in Orlando is designed hassle-free and it is intensive on the concept of what poeple really loves of wáter park, but also wht it doesn’t like to make the perfect offer for the visitors.